Rosneft is a pioneer of innovative technologies in the Russian oil and gas industry. As the largest producer of high-quality lubricants in Russia, we export to more than 100 countries around the world. Our company has a solid scientific and technological foundation. We have over 10 R&D institutions, in which new products and technologies are being developed. Moreover, our company has the capacity to produce synthetic and mineral base oils and additives on our own. Today, our lubricant business is working towards a new strategy in response to constantly changing demands. In 2017, Rosneft launched the Rosneft Magnum, a line of high-quality synthetic engine oils. A comprehensive market research was conducted in order to identify the client’s needs. The new line has not only widened the range of customers but also offered more diversified products to each customer. Now all consumers, ranging from those who have brand-new cars to those who have outdated cars, can enjoy Rosneft’s special selection of lubricants. The strength of the Rosneft Magnum lies in the customization. Each product was created in order to maximize the performance in particular conditions and applications. For example, we have an engine oil designed particularly for brand-new cars with high-performance level (Ultratec), or an engine oil for cars operating in low temperature regions (Coldtec). Large-scale laboratory and bench tests have been conducted to support the optimal features of each product. The Rosneft Magnum is an illustration of the technological innovation of the company. With the launch of the Rosneft Magnum, Rosneft started producing synthetic base stocks on its own. The new products have a significantly higher performance level compared to the existing products in the market. Rosneft Magnum Ultratec is designed for the modern cars of the world's leading manufacturers such as Mercedes-Benz, Volkswagen, Renault, Ford, GM, Fiat and Peugeot-Citroen. Salicylate additives included in the oil provide superior engine protection against high and low temperature deposits. Rosneft Magnum Coldtec has superior low temperature characteristics. 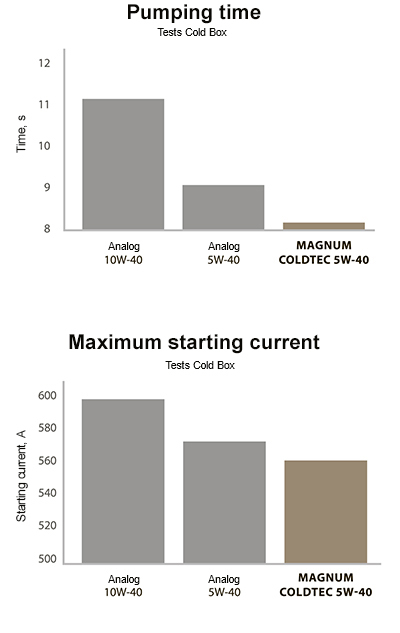 In regions with severely cold winters, a reliable cold start is the most important requirement for the engine. Scientific study has demonstrated that this product can provide a strong protection for your engine at extremely low temperatures. Rosneft Magnum Runtec has been developed particularly for the vehicles demanding extended oil drain intervals. It not only stabilizes the operational units and assemblies, but also significantly increases the service intervals without damaging the engine. 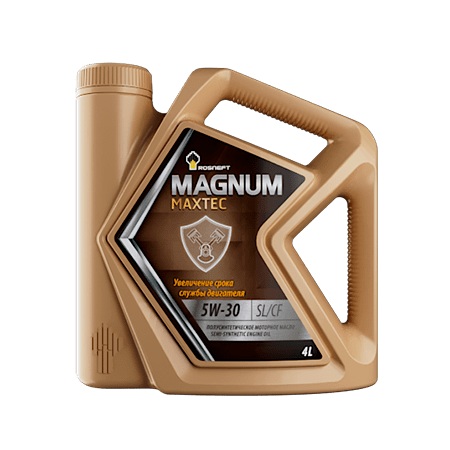 Rosneft Magnum Maxtec can extend your engine’s service life by maximizing the engine protection. Regular operation of any car inevitably leads to a growth of the engine mileage. In order to protect your engine, you need to choose a proper engine oil that can prevent wear and minimize deposits. Ronset Magnum Cleantec helps to maintain a clean engine regardless of your car age. An average age of the cars in many countries still exceeds 10 years. Engines of such old cars do not have high loads as modern cars do. As a result, deposits on the engine can reduce its life. This product helps to keep your engine clean by preventing those deposits. Rosneft Magnum Ultratec 5W-30 – is a premium fully synthetic engine oil. It is designed for use in gasoline and diesel engines which require API SL/CF or lower service categories. 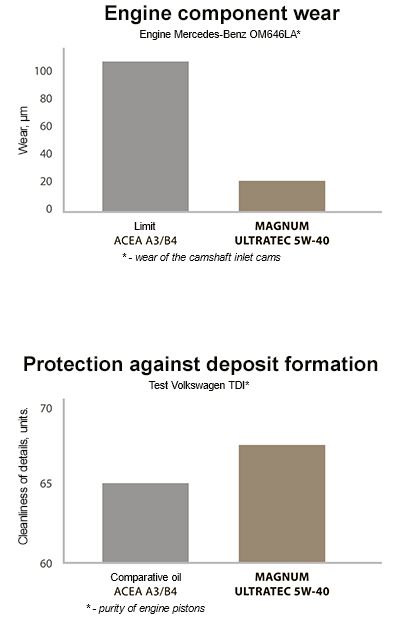 • Tests on Volkswagen TDI engine for measuring detergent and dispersing properties under high-load operation. 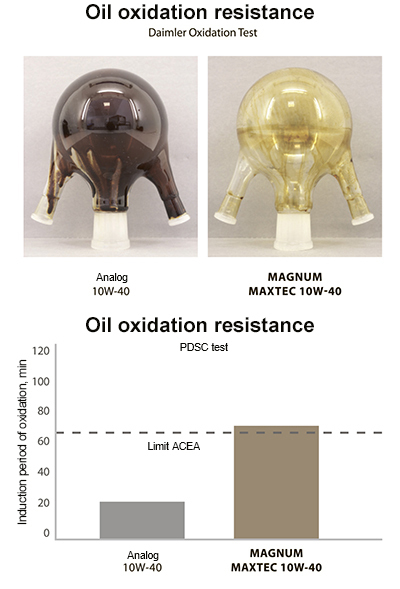 Tests of Rosneft Magnum Ultratec oils compliance with the requirements of car manufacturers and international specifications have been performed in certified test centers of Europe and the USA on engines of such producers as Mercedes-Benz, Volkswagen, Renault, Ford, etc. Rosneft Magnum Ultratec effectively protects the brand-new cars’ engine even under the most severe conditions. The product contains salicylate additives and complies with the requirements of the leading global automakers, such as Mercedes-Benz, Volkswagen, Renault, Ford, GM, Fiat, and Peugeot-Citroen. Rosneft Magnum Ultratec 5W-40 – is a premium fully synthetic engine oil. It is designed for use in gasoline and diesel engines which require API SN/CF or lower service categories. 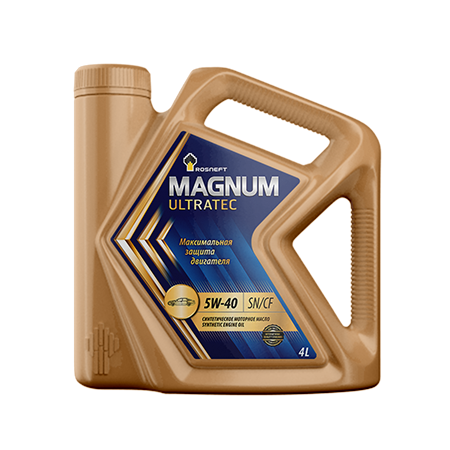 Rosneft Magnum Ultratec 10W-40 – is a premium fully synthetic engine oil. It is designed for use in gasoline and diesel engines which require API SN/CF or lower service categories. Rosneft Magnum Coldtec 5W-30 - is a premium fully synthetic engine oil which provides an easy engine startup at extremely low temperatures. It is designed for use in modern gasoline and diesel engines of passenger and light commercial vehicles which require API SN/CF or lower service categories. • Measurement of low temperature viscosity by Mini-Rotary Viscometer (MRV). At a low temperature, the oil has higher viscosity, thus taking additional time to be pumped through the main oilways. At this stage, engine goes into oil starvation period and the battery experiences an increased load. Important conditions for a reliable cold start are preservation of a stable viscosity at low temperatures and creation of a stable oil film, which protects the engine during low temperature cranking. Rosneft Magnum Coldtec 5W-40 - is a premium fully synthetic engine oil which provides an easy engine startup at extremely low temperatures. It is designed for use in modern gasoline and diesel engines of passenger and light commercial vehicles which require API SN/CF or lower service categories. Rosneft Magnum Runtec 10W-40 – is a premium fully synthetic engine oil which extends the oil drain intervals. It is designed for use in modern gasoline and diesel engines of passenger and light commercial vehicles which require API SN/CF or lower service categories. • TEOST МНТ-4 — a modification of the ЗЗС test where oil behavior is analyzed in a zone of the cylinder-piston group. When engine oil is consumed, oxidation process inevitably creates certain amount of deposits on the engine parts, such as cylinder-piston group, crankcase and cylinder head. There are several components essential for extending engine’s service intervals. First, engine oil should possess superior anti-oxidant properties which can maintain throughout the additional operational period. It should also contain more detergent and dispersing additives, which will prevent the accumulation of harmful deposits. Rosneft Magnum Runtec 20W-50 – is a premium fully synthetic engine oil which extends the oil drain intervals. It is designed for use in modern gasoline and diesel engines of passenger and light commercial vehicles which require API SN/CF or lower service categories. 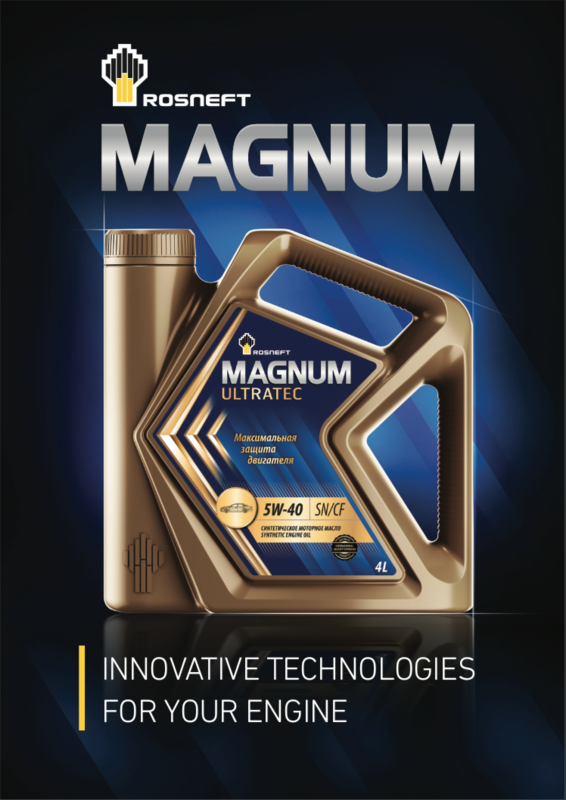 Rosneft Magnum Maxtec 5W-30 - is a premium semi-synthetic engine oil which effectively protects high-mileage engines. It is intended for use in gasoline and diesel engines of passenger and light commercial vehicles which require API SL/CF or lower service categories. 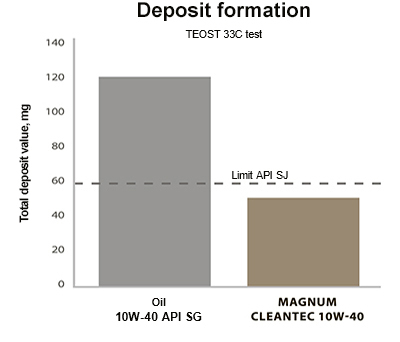 • Thermo-Oxidation Engine Oil Simulation Test (TEOST 33C) — a test for modeling the engine oil tendency to oxidation and deposit formation, in particular in high temperature zones including engine turbocharger. 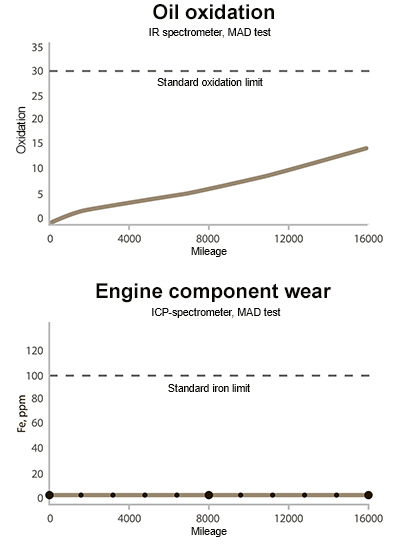 After several years of operation, engine characteristics begin to change because of the deposits and wear. The wear of engine components increases gaps, and deposits eventually lead to clogging of oilways, ring sticking and compression loss. Moreover, these problems could cause engine failure. For high-mileage cars, it is necessary to use engine oils with a particular emphasis on the protection. The product effectively protects your engine by preventing further engine wear and minimizing deposit formation. 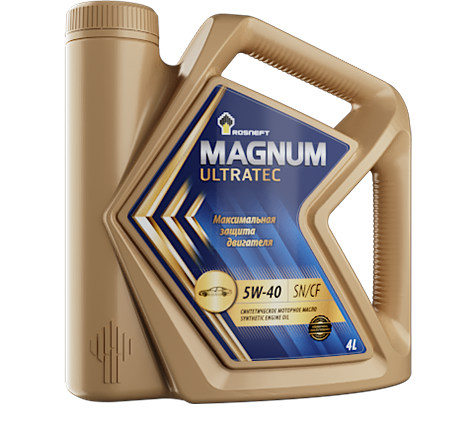 Rosneft Magnum Maxtec 5W-40 - is a premium semi-synthetic engine oil which effectively protects high-mileage engines. It is intended for use in gasoline and diesel engines of passenger and light commercial vehicles which require API SL/CF or lower service categories. Rosneft Magnum Maxtec 10W-40 - is a premium semi-synthetic engine oil which effectively protects high-mileage engines. It is intended for use in gasoline and diesel engines of passenger and light commercial vehicles which require API SL/CF or lower service categories. 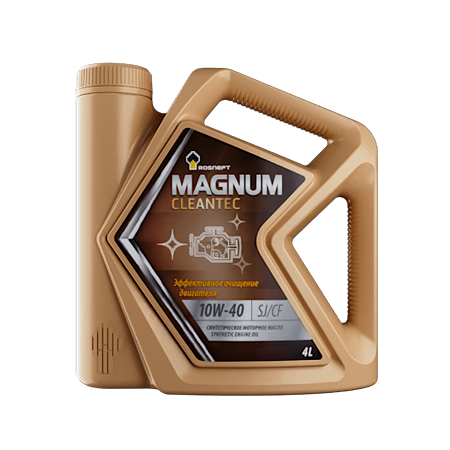 Rosneft Magnum Cleantec 10W-40 - is a premium synthetic engine oil with enhanced detergent and dispersing properties. The product is designed for use in gasoline and diesel engines of passenger and light commercial vehicles. • Pressure Differentiation Scanning Calorimetry (PDSC) — a test for measuring oil oxidation resistance in thin-film conditions typical for the combustion chamber where an oil layer being on the cylinders surface is subjected to high temperatures in the presence of oxygen. In general, standard mineral oils have low stability against oxidation. If the additives fail to properly prevent the oxidation of mineral base oils, deposits can accumulate on the engine components. If you want to keep a clean engine, you need to choose an engine oil that contains high-quality additives and synthetic base stocks with superior anti-oxidant properties. In this way, you can effectively prevent oxidation and minimize deposits on your engine. Unfortunately, there are no products matching your request. To get recommendations for your vehicle, please ask Rosneft experts. Please select one of the categories above regarding your questions or concerns. We will be glad to respond within 24 hours. Thank you for your patience and using our service!